UVic Women in Science presents an interview series highlighting women in the scientific community on Vancouver Island. Karolina Papera Valente is a PhD candidate in the Mechanical Engineering and Chemistry departments. 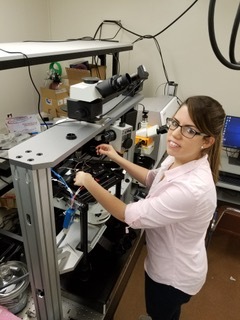 Karolina has is currently building a device to analyze breast cancer tissue and measure the treatment impact, while exploring her aspirations to teach and mentor. What is your field of study and what stage of your education/career are you at? I am in my third year of my PhD in mechanical engineering. However, my project is mechanical engineering combined with chemistry. When did you first become excited about science? I’m not sure, I’m just excited about everything! I went to high school in Brazil and I always liked all of the subjects. In my last year of school I had to decide what field I was going to go into and I decided on law school. Part way through, I realized that I had a passion for chemistry and math so I switched into that! That decision definitely drove the school administration and my parents crazy but it ended up working out well in the end. How did you get to the position you are in today? Was it a straightforward career trajectory? What are your current career aspirations? I did my Bachelors in Brazil, and in my last year of studies I had the opportunity to travel to Portugal to finish my degree. My plan was to return to Brazil after my year abroad; however, my parents knew that when they put me on that plane that I wouldn’t be coming back. I did some research in Portugal and I used this to transition into a Masters program there. The path to my PhD was actually fuelled by love - I met the love of my life in Portugal and he was moving to Canada for his PhD. So I started looking into programs and came across the mechanical engineering program here at UVic. We both applied and got in. When I started my PhD here, I had to teach even though I had never taught before. Although it was daunting, I ended up falling in love with teaching more than my research! My current plans are to finish PhD with a strong project and go towards academia in order to become a teaching professor. Describe your research focus. I am building a microfluidic device that analyzes breast cancer tissue and studies in a small scale treatment options involving gold nanoparticles and radiotherapy. Since it is a small device, the quantities of tissue and drug needed are miniscule, which allows us to do many tests in a short time frame at a fraction of the cost it would be to traditionally treat the same disease. I’m focusing more on what the impact of the tissue environment in the delivery of drug/nanoparticle as opposed to the traditional treatment of disease. What do you enjoy about this field/your work? I enjoy the aspect of a gaining a better understanding of what is going on in the cancer and the movement towards the prevention of future cancers. Although this is considered less economically viable at the moment, I believe that in the future it will be the go-to treatment option as it will eliminate lengthly treatments and avoid the issue of tumour regression and immunity. What have been the obstacles for you during your education/career? Do you believe any one these were specific to being a female? I have had many obstacles, most of which have been throughout my PhD. In my Bachelor in Brazil and Masters in Portugal, the cultural diversity was close to zero; however there was little difference between being males and females, as the faculty was approximately half male and half female. In my PhD; however, the cultural diversity is very high but there are very few females. I would say about 90% of the mechanical engineering PhD candidates are males and only 10% are females. We have a challenge with the cultural belief that female scientists are lesser than their male counterparts. What bothers me the most is that even though we see these different points of view between genders, people in powerful positions have these mind sets that females are lesser. From my point of view, this is a major problem. If you are in a high position and you see this happening and do nothing about it, you are cultivating this mindset so that it can proliferate at a greater rate. In the beginning, I found these obstacles very difficult to deal with, but now I’m much better and identifying where I should speak up because I know that if I am there, it is because I deserve to be there. What do you think about mentorship? Have you had any strong mentors during your career? And do you think it’s an important component of professional development? Mentorship is very important. When I started my PhD, I met Dr. Emma Davy and she was a very good mentor to me because she saw exactly what I saw with the difference between females and males in STEM fields, in spite of the fact that it shouldn’t exist. She told me to “Ignore this, keep going, know you’re meant to be here and don’t be afraid”. When I mentor, I try to observe if I’m giving the same opportunities to males and females when I’m teaching. For example, in lab I try to observe if anything unfair is going on (males forcing opinions on others and if conversations and workloads are balanced). I believe that I have a balanced teaching style. I help a lot of undergrad students to not be afraid of speaking up. Mentorship is definitely an important component of not just professional development, but personal development as well. When you see somebody who is your mentor and she or he is succeeding, it is inspiring! How do you balance your hectic work/school schedule with your life? What are your interests outside of school? My life is pretty much here at UVic (mostly because my partner is also here) so work and home are together. I do love to run and read books! You might see me reading while walking around ring road. Usually I spend 12-13 hours at UVic per day, but that is only because I love doing what I am doing. Optional/off the record questions: imposter syndrome (phenomenon) is quite prevalent in female scientists. Is this something you’ve observed during your career? Do you experience it? What do you think we can do to counter it? I feel this every day. It is easier now for me to suppress it than it was in the beginning, but it took me a lot of practice. I always felt that I had to work twice as hard as men to show that I belonged or that I had to speak up louder so that I can be heard. I think it gets easier to deal with time, practice, and by having good and strong female friends you see succeeding. It is also easier to suppress when you have strong mentors. Imposter syndrome is very common in graduate students. What has been your greatest accomplishment in your education/career? I think the greatest accomplishment I have had is the feedback I get from students in courses I have taught. Partially thanks to the generally positive feedback, I was invited to teach full time as a sessional instructor in engineering. In January, I get to teach a biomedical engineering course, again as a sessional instructor. What are you still hoping to accomplish? I hope to finish my PhD with a strong defense and more papers published. My end of chapter goal would be to get a teaching position and be able to inspire students in the way I felt that many people inspired me throughout my life. How do you contribute to supporting female scientists that are following in the same path as you? I’m a big supporter of all of the female grad students, and they feel very comfortable coming to talk to me (especially the chemistry students). I am a very honest person, so I tell them right away what I think. The best way to support female scientists for me is through teaching. I try to balance my classroom, balance the work equally, and hear from both genders equally. What programs/events would you see as being most useful for women in science here at UVic? I would say having inspiring female talks would be very nice. This would include both successful female scientists in academia as well as in industry, and have them mention the challenges they have faced throughout their careers as well as their successes. It would also be greatly beneficial to have workshops on body language for female students in order to teach them to lean in and speak up. What advice would you give to students and young females interested in science? I would say don’t let anybody make you feel less just because you are a female. You are here because you belong here and have earned it. Don’t be afraid of speaking up about what you think. It takes practice to learn how to be confident if it is not how you are. Just fake it until you make it, once you do it enough times, I believe you will become!